Nearly 3.3 million people have visited the Lake Mead National Recreation Area in the year’s first six months, the National Park Service announced. The park, the fifth most-visited unit of the National Park Service, saw 3,376,492 visitors from Jan. 1 through June 30, a 6.1 percent increase from the first six months last year. The park saw 873,323 visitors in June, a 11.9 percent increase from the same month last year. May and June saw a visitation increase of 11.47 percent compared with 2012. Nearly a quarter of the visitors use the entrance closest to Boulder City. Vanover said nearly 894,000 park visitors entered through the Boulder Beach Entrance Station between January and June. However, the most popular area of the park this year has been Katherine Landing on Lake Mohave near Laughlin. Visitation increased nearly 105 percent to almost 600,000. On Lake Mead, Hemenway Harbor has been the most popular destination with more than 325,000 visitors, up slightly from 2012. 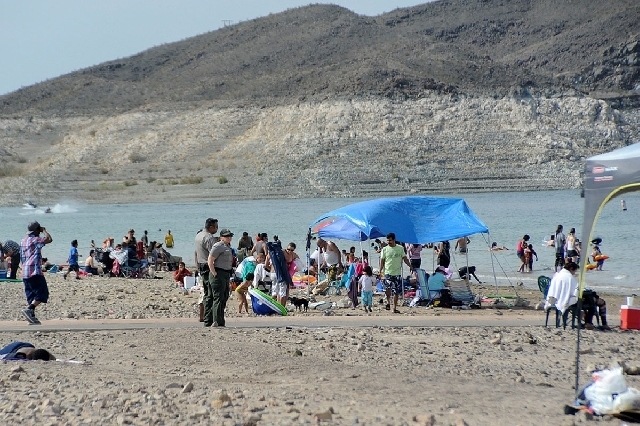 Boulder Harbor, Callville Bay and Willow Beach are other popular areas with more than 100,000 visitors to each area so far this year. The Fourth of July weekend saw 240,000 visitors, while the park had 225,000 during Memorial Day weekend. However, visitors on average are staying less time in the park. Visitors averaged a 7.9 hour stay the first six months of the year, compared with 8.2 visit hours per stay the fist six months of 2012. See historic data on visitation to the park at http://bit.ly/15FX5hg.